Beirut (Agenzia Fides) - Accredited international scientific studies on the demographic changes in Lebanon show that the decline of the Christian component will stop in the coming decades. These scientific projections were welcomed with relief in Lebanese ecclesial circles. The reassuring statistics regarding the demographic size of Christians in Lebanon are contained in the yearbook of International Religious Demography 2018, so much so that the Minister of Provisional Government Municipalities, Nihad al-Mashnuq – reports Lebanon Debate - wanted to bring the gift of the volume to Maronite Patriarch Bechara Boutros Rai, on the occasion of Christmas. The last official census carried out in Lebanon is that of 1932. At that time, there were 875,252 inhabitants in the Land of Cedars, and 53% of them were Christians. All subsequent statistics on the composition of the Lebanese population from a religious point of view are based on studies and reports considered unofficial, even when they were drawn up on the basis of research with a high level of scientific reliability. Every year the Yearbook of International Religious Statistics provides a global overview on the composition of the populations of the countries from the point of view of the different religious affiliations of the inhabitants, attaching in some cases also contributions and statistics with projections on future foreseeable changes in percentage ratios between the different religious components in the individual nations. The Yearbook 2018, regarding Lebanon, takes into account the changes in the percentage consistency of the different Lebanese religious components on the basis of the emigration/immigration flows and on the changes in the fertility rate in the individual faith communities. With regard to Lebanon, the figures reported in the 2018 yearbook show that the Country has been marked by strong processes of emigration of the Lebanese population in the last 35 years, both due to economic reasons, and internal and regional conflicts that have involved the Lebanese nation. In the period 1975-2011, the expatriates from Lebanon were more than 1 million 567 thousand, and of these 46.6% were Christians and 53.4% Muslims. According to the data provided, between 1971 and 2004 there was a decline in the fertility rate also in the Muslim population. Moreover, since the beginning of the Lebanon war in 1975 and until the mid-1980s, the rate of the emigration of Christians was much higher, but this trend stopped between 1984 and 2011. As a consequence, the division of immigrants on a religious basis, from 1975 to 2011, was found to be 46% Christian and 54% Muslim. 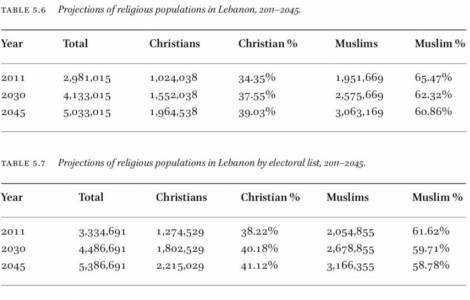 Based on these findings, currently Christians - Maronites and others - represent 38% of those entitled to vote in parliamentary elections in Lebanon. But according to scholars of demographic trends this will stop and there will even be a slight inversion. Reports show that the Christian population has remained stable over the last two years, and is expected to increase from 38% to 40% in the next 19 years, reaching 41% in the next 34 years.